Many Christians haven’t any idea what real “worship” is! And, yet, Scripture teaches us that it is the most important thing that we can learn to do. 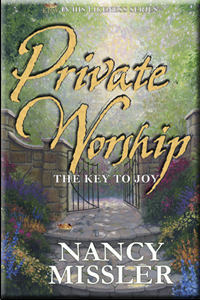 With questions at the end of each chapter, Private Worship: The Key to Joy makes a great Group Bible Study! What is Worship – Why is it so Important? Learn more about “The Key” with these supporting materials. Praise the Lord Jesus Christ for holy and godly women even in these times. I am a teacher of the Word at our local Presbyterian Church in Malawi (Mchengautuba CCAP). I need this resource on worship to help in the growth our congregants and youth but currently am financially challenged. Would you please send me this book. We received your request for the book Private Worship, you will be getting a separate email with a PDF version of the book. May the Lord bless you as you learn about His Intimacy.